"Sorry, world, this is not 'Lost' and I am not one of The Others. I am enough exactly as I am." Growing up in a mixed raced household is easy — it's explaining your heritage to others when it becomes difficult. "To describe something as being black and white means it is clearly defined. Yet when your ethnicity is black and white, the dichotomy is not that clear," actress Meghan Markle wrote in her 2015 essay for Elle UK. Markle, who has secretly been dating Prince Harry for months, recently re-shared the piece on her own lifestyle website The Tig. In the piece, the "Suits" star recalled instances of racism she'd experienced throughout her youth and adult years while auditioning for roles in Hollywood. While Markle originally believed her ethnic ambiguity could be used as leverage, allowing her to transform into any race with the help of costumes and props, she soon discovered it was a hinderance in Hollywood. "Sadly, it didn't matter: I wasn't black enough for the black roles and I wasn't white enough for the white ones, leaving me somewhere in the middle as the ethnic chameleon who couldn't book a job," she recalled. 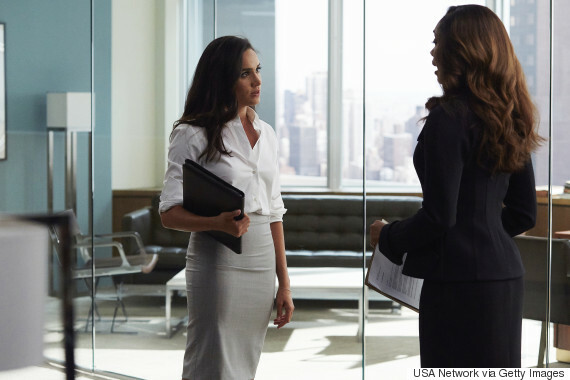 Meghan Markle as Rachel Zane, Gina Torres as Jessica Pearson on the set of "Suits." The 35-year-old wrote she was eventually cast as legal aid Rachel Zane on the hit series "Suits" — a role she says stole her heart. "The show's producers weren't looking for someone mixed, nor someone white or black for that matter. They were simply looking for Rachel," she wrote. But when the show's producers cast dark-skinned actor Wendell Pierce as Markle's on-screen father, fans of the show suddenly spewed out racist comments. Markle recalled fans questioning the casting decision and even taking back compliments they had given her once they realized she was half black. "The reaction was unexpected, but speaks of the undercurrent of racism that is so prevalent, especially within America," she said at the time. Markle went on to admit she finds it horrifying how both sides of her culture have "become victims of spin in the media" — a sentiment later echoed in Prince Harry's statement regarding the way Markle has been harassed by the media. But Markle doesn't let the press drag her down, and she acknowledged that while being born to a white father and black mother puts her in a "grey area," she opts to change the conversation all together. "Make a choice: continue living your life feeling muddled in this abyss of self-misunderstanding, or you find your identity independent of it. You push for colour-blind casting, you draw your own box. You introduce yourself as who you are, not what colour your parents happen to be," she said. MORE: born and raised Living Meghan Markle meghan markle background Meghan Markle Biracial Meghan Markle dating prince harry meghan markle essay meghan markle mixed race Meghan Markle Other meghan markle photos Meghan Markle prince harry Meghan Markle racism meghan markle suits video Who is meghan markle?